When the subject of ‘luck’ in hockey is broached in analytics conversations it generates a high rate of skeptical eye-rolls per 60 minutes. Maybe it’s blissful ignorance or a desire to believe that hockey players have more control over highly variable outcomes, an illusion that I’m sure we’d all like to believe applies to our own lives too, but hockey fans tend to struggle with the idea that there are numerous chaotic factors influencing results beyond what on-ice talent can control. The role of “luck” – good fortune, or whatever other nomenclature you’d like to use – in hockey is very real. Enormously so. It’s most commonly lumped under the “PDO” metric (the sum of on-ice shooting percentage and on-ice save percentage, which should, in theory, be hugging either end of the 100 plateau). While PDO has certainly been shown to be a useful tool in identifying outliers on either end of the spectrum, there are other applications for luck too. One area that luck exercises an enormous influence is pertinent to the Vancouver Canucks, mired in the midst of a four-game home losing streak. It’s their success in one-goal games. Or maybe more aptly, a lack thereof. 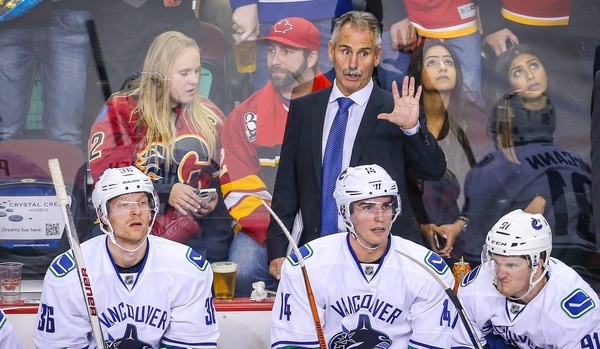 After a strong start to the campaign, things haven’t gone quite as smoothly for the Canucks of late. They’ve failed to get a win in their last four games and while a small rough patch like that over the course of the 82-game marathon is inevitable, it does bring up an important distinction. The idea that certain teams possess the inherent ability to buckle down when it matters most with the game on the line and channel their inner ‘will to win’ is nothing short of a fallacy. If being particularly clutch in this fashion was something that legitimately separated the great teams from the others, then in theory we’d be able to see it repeated from year to year. That’s not the case, though. In fact, there’s plenty of evidence to not only show that a team’s success in one-goal games generally fluctuates from one season to the next but is also hardly a harbinger of that specific team’s true talent. First of all, the 19 teams included are the only ones to have finished a single season between ‘09 and ‘15 with a winning percentage of over 60 percent in one-goal contests. A couple of those seasons obviously include the ‘12-’13 lockout-shortened season, which has a much smaller sample size, but was included for the sake of completeness. Maybe this isn’t the best timing for a take like this, but Bruce Boudreau is a fantastic bench boss. I can’t quite explain how or why, but his Anaheim teams have been beating the math for a while now. The main takeaway from the chart above is that nearly every single team that was benefitting from winning a high percentage of closely contested games in one season fell back down to the pack the following year. Some regressions were more pronounced than others, but even something as seemingly menial as a 10 percent dip means that between four and eight additional points were left on the table (assuming roughly 40 of the team’s 82 games were determined by one goal). Given how competitive the league is, that gap could very well determine the difference between a team qualifying for the playoffs or not. Which brings us back to the Vancouver Canucks, who won a whopping 22 of their 31 one-goal games last season. To give it some context, that 71 percent winning clip was the third highest rate for any one team over the past six years. Playing with that very same fire has burned them here in the early going, as they’ve managed to win just one of the league-high six one-goal games they’ve played in 2015-16. It’s easy to overreact to results in a small sample, and it’s just as easy to panic when you’re falling short in that many close games. But such is the life of a team that isn’t particularly dominant and has to scratch and claw on a nightly basis. The room for error tends to close rather quickly when walking the tightrope of games decided by just a lone goal, opening up the potential for one play – a weird deflection, or a puck ricocheting into the net off of a defender’s skate – to decide the outcome. In Vancouver’s case, that margin has been whittled down even further because of some self-inflicted wounds. While the team’s decision to give younger players like Jake Virtanen and Jared McCann a fighting chance to start the season is both commendable and reason for optimism moving forward, the coach’s lack of trust in them hasn’t done the team as a collective any favours in the present. To be successful in the NHL these days you need to possess the ability to roll four effective forward lines without too noticeable a drop-off in play. Being able to allocate 5v5 ice-time as evenly as possibly prevents the top players from being run into the ground, preserving them for the later stages of a game. That was something the Canucks had down to a science last season, as every single of their regularly dressed forwards was somewhere between 11.08 and 13.42 5v5 minutes per game. It seems fair to wonder whether the usage rates have been manifesting themselves in the team’s late-game struggles as they run out of gas. Even though the Canucks haven’t necessarily been all that impressive as a unit at even strength in any regard, their play has been particularly worrisome come the third period with the final outcome still hanging in the balance. When the score is within one goal in the third frame their 45.7 possession percentage is 25th in the league. According to War on Ice they’re averaging both the second fewest total Corsi events and the second fewest total scoring chances per 60 as a team in those situations, only ahead of the New Jersey Devils in each category. To say they’ve been playing a conservative, anemic brand of hockey would be an understatement. As a result, it can’t come as a surprise that they’ve yet to score a goal in such situations through eight games. Still, it’s important to keep this rough stretch in the early going in perspective. While there are justifiable reasons for concern, it’s not as if this is some sort of fatal character indictment against this version of the Canucks team. There isn’t an innate lack of leadership, or whichever other random intangible your favourite talking head can think of, that’s holding them back. There’s more to it than that, and the season is still young. The regression to this degree is also, somewhat ironically, overly skewed in the opposite direction and unsustainably unfortunate in its own right. Moving forward they probably won’t continue to lose one-goal games by the barrel full, even if the truth of the matter is that the Canucks should wind up somewhere back in the middle of the pack this year. With that being said, it’s still becoming abundantly clear that they’ll need to create some of their own luck now that they’re not enjoying the same good fortunate that they did last season. Otherwise, it could wind up being a long season filled with late-game heartache. So, the chart doesn’t include last year, b/c both Vancouver and Anaheim would be there? And what about Anaheim? If there is one team that seems to “know how to win the close ones” it seems to be the Ducks. I didn’t include the Canucks and Ducks (and Jackets, Preds, Blues) from last season because we don’t know how they’re going to do this year. The whole point of the chart was to show the difference from one season to the next. And as I mentioned, the Ducks under Boudreau have managed to keep bucking the trend somehow. I watched them play. I don’t think the skill or the ability of the team is coming into question. Their work ethic is the problem. The previous one goal games have all seemed like a mini version of the Calgary series which was supposed to be fixed with the grit that was added. The team doesn’t need role players, it needs effort for sixty minutes. It isn’t a mystery. One of the primary problems is the second line and especially bo. He hasn’t been terrible but again the effort from last year isn’t there. It seems like there’s the perception that everybody on that line has a guaranteed spot, which isn’t and shouldn’t be true. It’s an issue that stems from the players knowing that the team needs depth and younger players. I would rather see virtanen making plays to help the team win rather than checking players unnecessarily. The rest of the team is fine, but sbisa needs to be scratched so that bartkowski and weber can form the bottom pairing. So you’re saying that the entire regular season last year, They had the work ethic necessary to win one goal games, but somehow lost it when facing the Flames in the playoffs?